If you’re planning to visit Bali then there is a good chance that you will fly into the Bali Airport. To get your holiday started in the right way I created a guide that covers how to get from the airport to the popular tourist destinations. I also cover a tiny about transportation in Bali. Let’s get started with the easiest way to leave the airport and get you to your hotel or private villa. Ngurah Rai International Airport (NRIA) with IATA code: DPS is located in the South of Bali. 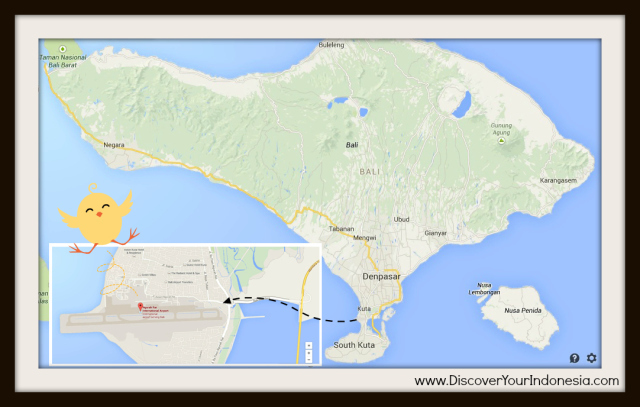 The airport is located between Kuta and Jimbaran, but is known as Denpasar Airport / Denpasar International Airport. This might confuse some people, as the airport is almost 13 km away from Denpasar. Bali Airport is very busy, very modern and very confusing. It’s been expanded to deal with the growing number of tourists that visit the island, however that doesn’t mean the expansion was well managed. Like most airports, Denpasar Airport is located just outside of the major urban centers. There are three main options when leaving the airport. You can arrange for a driver to pick you up from the airport, arrange a taxi or get a shuttle bus. You can find shortcuts to each of the topics below. There are no official pick up points for metered taxis at Bali Airport. This means you have three choices. The first choice is ordering a taxi from one of the official taxi counters at the airport (this is one of the most expensive options, example: a transfer from the airport to Ubud costs at least Rp250,000, it should be half that price). If you are not on a tight budget and you want to catch a taxi without having to haggle then I would suggest ordering a taxi from one of these desks. The people behind them can speak good English and you are guaranteed to get a good service. As you walk out of the arrivals hall at Denpasar Airport you will get a lot of people offering taxi services. These taxi drivers are not metered and you will have to bargain with them and even then you will pay more than you should. I would avoid ordering a taxi from any of these drivers as the price is often more expensive than at the official taxi counters (especially if you look very confused). The price can be anything from Rp50,000 – Rp200,000 more than it should be depending on where you want to go. It is possible to catch a metered taxi, but to do so you will need to walk out of the airport premises. If you choose to do this, head towards the pickup point and then cross the car park. You will be able to catch a taxi (I’d recommend Blue Bird) as they exit from the car park. You can get a shuttle from Denpasar Airport to several of the larger hotels in Kuta. One of the companies that operate shuttles is called Plus Priority. A shuttle ticket costs USD25 and is valid for five days all over the island (Uluwatu, Ubud, Kuta, Legian, Jimbaran, Seminyak, Sanur, Tanah Lot, Nusa Dua and even to Kintamani). Plus Priority has a lounge at the International arrivals area of Bali Airport. It is open from 10 am until midnight. I’ll tell you a bit more about Plus Priority when I let you know about transportation options on Bali. 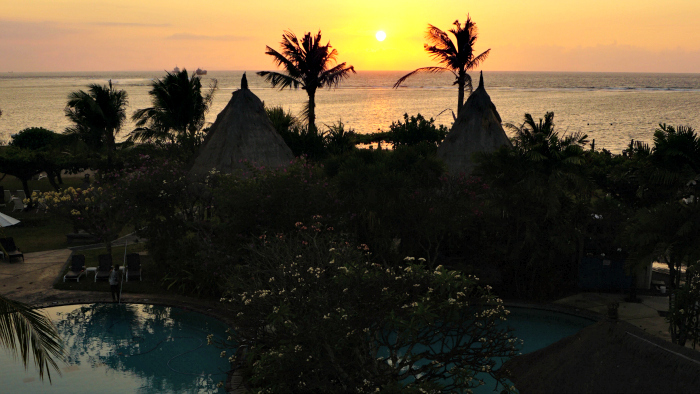 The third and final option is a private transfer from Bali Airport to your hotel. In many ways this is the most convenient option (especially if you are getting off a long haul flight). You don’t have any hassle trying to organize anything on arrival. With the private transfer a person holding a sign with your name on it will meet you as you leave departures. If you choose the private transfer option the driver, who will speak English, will take you directly from the airport to your hotel. This is a great option, but you do need to arrange your private transfer before arrival. For more information about private transfer you can visit this page. Bali has no proper public transportation system, which makes private transport the most popular way to get around the island. Still, even though private transport is the only solution, there are a lot of options available. Let me lead you through the possibilities. Pura Ulun Danu is one of the most famous temples on Bali and a favourite with the tourists. Yes. 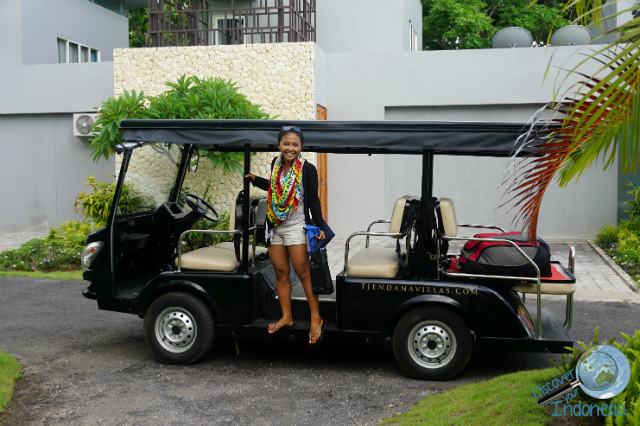 Renting a scooter or a car is the easiest way to explore Bali! Scooter rental per day is around Rp 50,000. While a good car rental is around Rp 600,000 (the price depends on the car type, whether you want a driver or not, the length of the rental, etc.). A car or motorbike rental gives you the freedom to go where you want when you want. It’s easy to rent a motorbike from almost anywhere in Bali; make sure you inspect the bike and the helmet before you make a deposit. There are a lot of people renting out old second hand bikes with very basic helmets. When it comes to car rentals things are a lot easier. With Discover Your Indonesia you can arrange a Bali car rental with a private driver. The cars are always well maintained and you get an experienced local driver who will share some of the best bits of Bali with you. If you plan to drive in Bali you need an international driving licence. The police do random spot checks. A national driving licence from your country of origin will (usually) not be accepted. Avoid any problems with the law by making sure you have the correct paperwork. Taxis are an easy, but expensive, way to get around Bali. It’s easy to find taxis with meters outside of the airport. One of the best taxi companies in Bali is called Blue Bird. Although these taxis do have meters, you might need to demand that they turn the meter on. If the driver refuses then just get another taxi. Don’t forget to have some small change. Sometimes taxi drivers can be a bit silly… Drivers often say that they don’t have change and things can be a bit annoying, especially if you are in a rush to get somewhere. Not cool. The last option I want to talk about is the shuttle service. There are several shuttle services in Bali that you can use. Top of the list is Plus Priority. Plus Priority offers a five-day pass with certain schedules (you can refer to the schedule here and the route map here) that cost you USD25. It is a hop on hop off service and you can use it as much as you want to (yes, unlimited) over five days. The route is extensive. You can go to Uluwatu, Ubud, Kuta, Sanur, Tanah Lot and even to Kintamani. 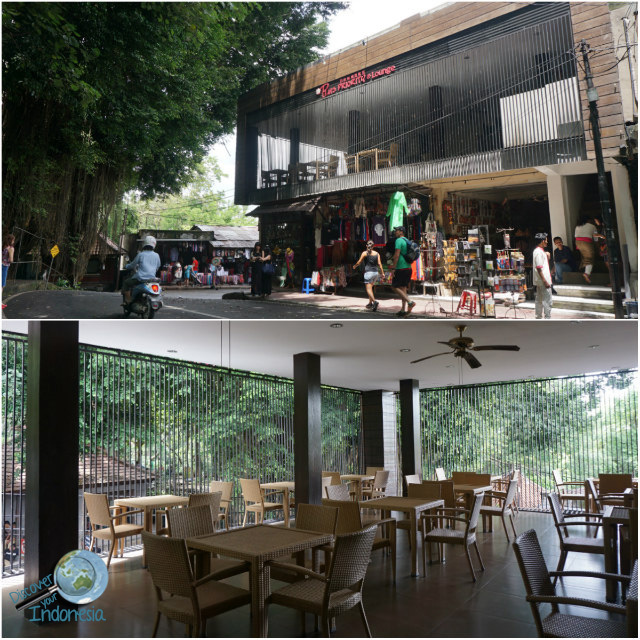 Plus Priority has two exclusive lounges, one in Kuta (close to Bubba Gump) and one in Ubud (right in front of Monkey Forest) – oh I love their Ubud lounge (pictures are below)! Oh btw, Plus Priority will work with one of the biggest national banks in Indonesia, BCA. The Plus Priority card works like the BCA Flazz Card. This means you will be able to top up the card when it expires (after 5 days have passed). Cool, right? A five-day Plus Priority ticket costs $25, which is a good price and it covers most of the island. The vehicles are comfortable and spacious. Of course an issue with Plus Priority is that you travel according to the bus schedule. However, there is a frequent service along the main routes. Another benefit of Plus Priority is that with a purchase of a ticket you get access to plenty of special discounts around Bali. For example you can get 50% discount on Cold Stone ice cream. Alongside the discount booklet you also get a free Indonesian sim card (special for foreigners) with a balance Rp 10,000,-. Isn’t that great? Super useful. For the time being, you can book and purchase the card. Just email: [email protected]. Plus Priority official website is currently only available in Mandarin. An English version is coming soon. P.S. Need help arranging your Bali holidays? Save yourself some time! Here’s a list of Shared and Private tours. Wow thanks for the tips on the airport transportation its always amazing to hear tips from locals about how to really find appropriate prices for taxis! Im storing this page for when I get to Bali this summer! Hi Alexis, my pleasure! I am glad you found it useful. Thanks for the info. What time is the earliest and last shuttle service from and to airport? The drop of place in every place is in town area? Is it after drop off can easily get a taxi to my hotel or homestay? Glad to hear that you found this useful! Thanks for the great informartion! I would like however to ask you, as you mention the 250.000 rpd to ubud with private taxi – i am staying at the ananda cottage in ubud and they offered me a 35 dollar taxi – is it because the location or the late night arrival? 23:10. Thanks again for the great information!!! Hi Sara, the hotel always charge more. Btw, I think it is better to arrange pick up from the hotel because you’ll arrive quite late. Hope it helps. Hi, I am hoping you can help. I am seeking some advice on how to get to Mataram from Denpasar Airport. I am travelling with my wife, 4 year old and 8 month old baby. We are travelling from Jakarta but due to the airport closure we are forced to go to fly to Denpasar arriving approx. 14:45. From there we need to get to Mataram. Firstly I would like to know if there is a bus + ferry service directly from the airport and what is the cost and time frame to Lembar port? From there we will either rent a car or taxi to Mataram if the bus does not go into Mataram. Obviously my concern is travelling with small children. Hope to get an early reply. Thanks in advance. I don’t know about bus and ferry service directly from the airport. Sorry I can’t help. Bali to Lombok is 4 hours journey by ferry. Thank you for your tips 🙂 Very good. Hi Nadine. I’d suggest getting a Blue Bird Taxi. You can also download the app GrabCar. It’s cheaper than a taxi, but just as convenient. So sorry for the late reply. I am not familiar with Kuta Kuta bus, is it Kura-Kura bus? I will be in Bali in January and got a pretty good price for airport transfer to Ubud from UbudTaxi. I will need two transfers on the same day but different time, as we are coming to Bali from different countries. One of the pick ups is on midnight. They gave me more discount since I book two transfers. Do you know anything about this company? Are they reliable? Not too much information about this taxi company on the web.Thanks for your help. I am not familiar with UbudTaxi (I rarely took a taxi in Bali).. I only know Blue Bird taxi. So sorry can’t help you out. All the best for your travels. This is extremely useful! I’m traveling to Bali in February and I’m extremely excited! Thank you for this, I feel more confident about my solo excursion now! 15 Feb 2016 Leave Sanur for airport at 12 noon. Is it cheaper to book a driver now for all the 3 days or when we arrive. Anyone you can recommend. I was pleasantly surprised by the improvements to the International and Domestic terminals in Bali on my recent transits. Spacious arrival halls, well signposted covered walkways for walking between the the two terminals and decent space in the departure halls on both sides with sufficient seating and other amenities. For the Grabcar service, is it possible to book a Grabcar for a faraway destination (particularly Bali Silent Retreat)? And how much would this usually cost? Is there internet in the airport where one could use the Grabcar app? This information would be very helpful! I used Grab taxi service from the airport to Ubud, it costs me around Rp 120,000. There is some cafes / resto (like Starbucks) that you can use the wifi service. There is a free wifi service from the airport, but I remember it wasn’t really working (super slow connection). Hi Samantha. I think it’s a fixed price, but I’m not certain. It will still be cheaper than a taxi. Any place i can stay near by airport? Maybe spend a night there before traveling to ubud on the next day. Hi Samantha. I don’t have a recommendation at the moment. I’ll have to do some research and maybe write and article on it. Found tis page really useful but a bit worry. Will be going to bali tis coming august but still haven’t done my homework about bali. Can u pls guide me. There r 4of us. 4 days at bali (arriving noon and leaving at nite). would like to visit main tourist spot. Can suggest pls. U think I can use the shuttle service or just book a car with driver for the 4 days? I haven’t book the stay but I think I will choose kuta bcoz I want to shop at nite. Hi Daniel, should try to use Grab car. It is around Rp 150,000-ish from the airport to Ubud. I will arrive late night at the airport . Are bike rentals and taxis available 24×7 ? Hi Manik. Taxis are available 24×7, bike rentals are not. Once again very informative, thank you. Are you aware of any tour companies that take a group of people to various tourist destinations in Bali on a day tour? Hi Priyoom. I can help you make arrangements for your tour in Bali. Just get in touch or visit the Bali Tours page. I’m traveling to Bali next Monday to Thursday and am looking for budget friendly ways to travel. I’ll be arriving at DPS at 3pm. Upon arrival, my friend and I need to get to Ubud. I’m considering taking BlueBird or downloading the Grab Taxi Service but I can only use it when I have access to wifi. Are there restaurants / Starbucks right by the airport? Also, do they speak English? Yes there are restaurants (and you can find Starbucks near the arrival terminal). Yes, most of drivers in Bali can speak basic English. All the best for your travels! I need to get to Ubud from DPS..
Will there be bike rental services right at the airport? Hi Maya, you can easily walk out from the airport and find Harris Hotel. Around the area, you’ll find some of the places to rent a motorbike. Make sure you check the motorbike before rent it, example: notice if there is any damage. Hi Chia. I’d recommend Grab Car or Uber as these are the most hassle free and cheapest services. We are planning our honeymoon this July/August, what is the best way to get from Bali to Ubud? Ubud is located in Bali. Do you mean from the airport to Ubud? You can take a taxi, usually they charge you around Rp 300,000 – Rp 450,000 for drop off or you can simply ask for airport pick up arrangement from your hotel. Have a great time in Indonesia. My friend and I are arriving at Denpasar airport on Tuesday @ 12:30am. What would be the most comfortable and safest way to go to the airport? Hi Dee, do you mean to go to your hotel? I’d recommend getting a pick up service from your hotel / get a taxi. My 2 relatives and I will be arriving in Bali on April 9 at around 7p.m. If I will get an Uber or Grab, are they allowed to go to the airport to pick us up and to go to Ubud? I just read that Uber and Grab are not allowed in Ubud anymore. Any updates? It has been 8 months since the last time I was in Bali. Last time I remember my Uber driver (in Bali airport) asked me to walk towards the departure area. I am going bali in June. Figuring how to get to my hotel in canggu from airport. My hotel quoted me rp 200,000. Will be getting a sim card at airport to have internet access. Very tempted to try blue bird cab or grab/uber. But read a lot of website that advise that not easy to get metered cab or not safe to use grab. Is it true? Roughly if I can get a metered cab or grab, do you know what is the price going to be like? Sorry for the late reply. Last time I ordered Uber at the airport, I had a hard time. I had to walk to the parking lot and pretend that I didn’t take an Uber. A bit silly really. I don’t know the condition now. Blue Bird taxi is ok. You can walk a little bit outside the airport if you really want to get a better deal. Probably around Rp 100,000-Rp 150,000. Yes I think you can get a sim card at the airport. Hope you have a great time in Indonesia. I like how you said that you can arrange for a driver to pick you up from the airport, arrange a taxi or get a shuttle bus when looking into transportation options. I am going on a trip this summer and need to arrange to have a driver pick me up. Thanks for the tips on finding airport transportation. Hi Sutton, hope you have a great time in Indonesia.